Milwaukee Yamaha have taken a step closer to joining the World Superbike ranks in 2016 after Yamaha Europe boss Eric de Seynes confirmed the factory would make a return to the series next year with a fully-developed R1. Shaun Muir’s SMR squad, which runs under Milwaukee livery, are as close to being a factory effort as you can get without the staff being paid by Yamaha, and are a key part in the development of the new bike with team manager Mick Shanley making regular trips to the race R&D department in Germany, run by engine guru Marcus Eschenbacher. “It has been talked about for so long now and I said to Yamaha when I joined them back in 2010 that this was a project in development. We won the BSB championship in 2011 and we have been waiting for the new bike to come along,” said Muir, speaking to bikesportnews.com at the team lunch in Italy. “There is a lot of talk about it, YME’s operational director has just said there is conviction they will be on the world stage in 2016. 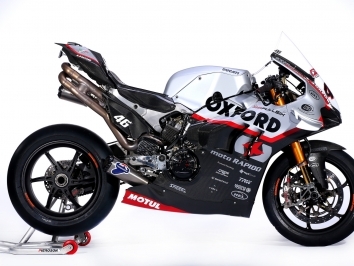 We haven’t been told anything directly about what is or isn’t going to happen but our bikes are being built by the factory and it is mirroring the WSBK they are building, using our guys to test it.